Craft Crush #2 is…. Charlie Hooson-Sykes! What do you do? The day job= An Executive Assistant in the School of Physics and Astronomy at the University of Manchester. Other than that the writing keeps me busy, as does the running and crafting when I get time! What are your first memories of crafting? So many. Both of my Nanas were knitters, my mum too, and all of them made us clothes. My first attempt at knitting was supposed to be a square in navy. It ended up being a triangle and my mum made it into a single strapped dress for my Sindy. I’m thankful to her for teaching me to use a sewing machine, to sew, to cross stitch, to knit. I can remember making my own school skirts by the time I hit Year 10 at high school. What inspires you? Where to start. Sometimes it will be an idea, a book, a pattern. When knitting I often have to wait for the wool to tell me what it wants to be and can start and restart a project several times before it feels right. I also can’t bear it when someone dumps something at a charity shop because of one little flaw. I’ve a Lipsy dress I picked up for £1 because it had a pull. It now has a mend and the M&S shirt I picked up for 99p because of a stain is now stain free and I wear it regularly. Even if something can’t be repaired, it can be reused, you just have to figure out what it can be. Who do you have a craft crush on? Lots of people! One of my biggest is Susan Crawford she recently started following me on twitter and I was speechless for quite a while – something which never happens to me! Her work is fantastic and I’m so envious because I haven’t got the patience for some of the lace patterns she’s done. Sara Etchells (nee Duncan) is another – she’s beautifully artistic and such a strong woman. I’m blessed to know her. I‘ve a little crush on Mr X Stitch (shhh, don’t tell him – I’ve only just met him) and consider myself so lucky to know some amazingly crafty people. I feel like I’m always learning, always finding inspiration and always in awe of their work. What three things could you not live without? Firstly, my husband. I’m exceedingly lucky to have found him. His patience and care and practicality balances me. There are times I wonder why he puts up with me. “The Galaxy” Charlie organised, coordinated and initiated to create with a group of people. Secondly, my phone. I am lost without it. I spend so much time speaking to people and networking and connecting people, the few times I’ve not had it, it’s been terrible. It’s not just the feeling of missing out, it’s the worry that someone might need me. Which is so inherently selfish! Bacon. I’ve been called a bacon princess, queen of bacon products, I even have a necklace with bacon on it. It was a toss up between bacon and gin – but occasionally I might not be able to drink gin, but I can *always* eat bacon. How has craft been a positive influence for you, your community or society at large? It’s always been in my life – from my Nanas to my mum and onwards. One of my sisters makes jewellery, the other is a whizz with a sewing machine. It’s just part of me and who I am I think. The community it brings with it is immense. There is nothing more rewarding than creating something or teaching someone else how to do it. 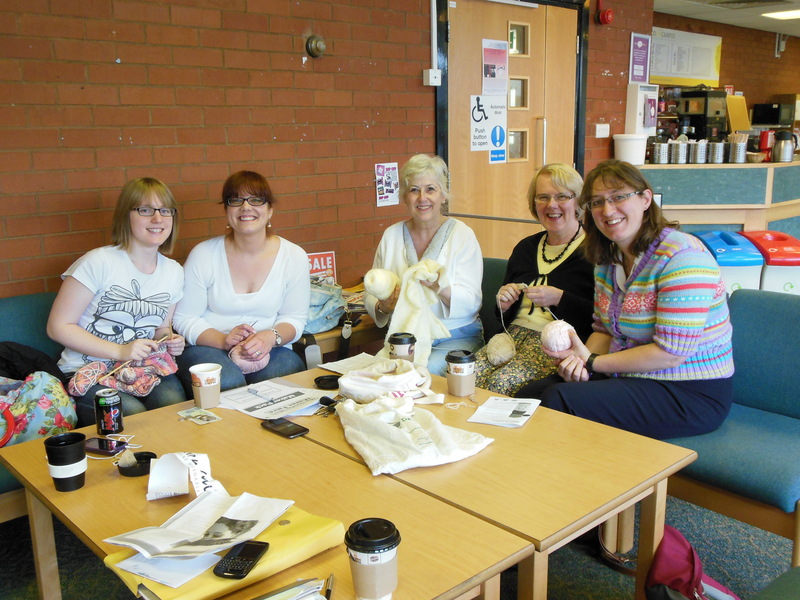 I’ve taught so many people to knit now, I’m wondering if I should start an alumni…. And after my mum died? I couldn’t have coped without it, especially losing my Nana the year after. It kept me sane, helped me cope and I’ve heard so many stories from others who’ve felt the same. It was a way to stay close to her at the same time as it being a coping mechanism. I’m also trying to find more ways to get men and boys involved in craft – I’ve been approached to run a group, but not found any volunteers to attend yet. 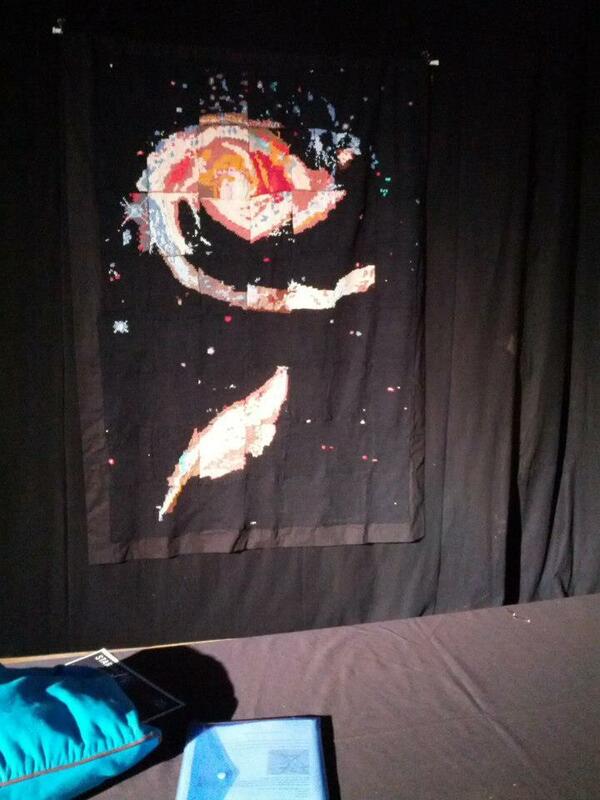 I recently took part in the Stargazing Live event at Tatton Park – taking the knitted galaxy created by the University In Stitches group. We also did a lot of craft with the children, just involving paper and sticky tape. The girls were straight into it, sticking, picking colours, curling streamers. The boys were keen, but didn’t have a clue – one little boy sticks in my mind as so desperate to do it, but so lost as to how. This whole ‘girls craft, boys don’t’ attitude is wrong on all levels. I feel I need to do a little bit to turn it around. If you could change one thing about the world, what would it be? Education. For everyone, male, female, young, old. It should be available to all – even if people don’t take advantage of it (more fool them), it should be free for all and available to all. It could change so much in the world.